Why Wide-Format Printing's a BIG Deal! 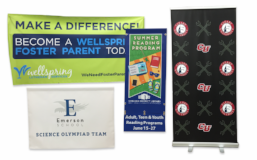 Banners We produce a wide variety of banners, including pull-up banners (for easy portability), backdrop banners to set off your trade show exhibit, outdoor banners to withstand all sorts of weather conditions, and advertising banners that make your message visible from a distance. Here at Print-Tech we use UV-based inkjet equipment, so once your piece has "cured," it's both weather- and water-proof. Your signs and banners can be used outside with no issues. POS materials ("Point of Sale," also called POP for "Point of Purchase") are also examples of wide-format printing. The next time you're in a store, check out all of the large graphics as you're shopping and in the checkout line. Look down to see if there are floor graphics. There might be freezer door signs as well as signs hanging down from the ceilings - and others affixed to the front windows. Yard signs Outside of commercial districts, there are more examples of wide-format printing. Yard signs are very popular. They have unique curb appeal, and they're incredibly affordable, even in small quantities. We've made yard signs for birthdays, graduations, garage sales, reunions, and, of course, to help customers sell real estate. Unlike some printers, we print our wide-format jobs directly onto the substrates, meaning we don't "print-then-mount." Printing directly onto the substrate is a higher quality job: it gives you a longer-lasting and sturdier sign or banner. There's no danger of the printed image separating from the backing. And lest you think your only substrate option is paper, we have great news: we can print on PVC, vinyl, foam core, canvas, window cling, and adhesive labels (temporary and permanent) as well. so if you can imagine it, we can produce it. Get in touch for more BIG ideas about wide-format printing!